Often it is require to convert the previously developed Maven web project to Eclipse web project, learn how convert the maven project into Eclipse Web project. Step by Step process of converting a maven web project into Eclipse Web Project and then testing in Eclipse. This tutorial teaches you to convert an existing maven based web application project to Eclipse web project so that it can be developed and tested from the Eclipse tool. After converting the Eclipse based Web application you be able to use the Maven features from the Eclipse IDE. So, its good idea to convert the existing maven based web application into Eclipse web project and then uses the Eclipse for development and testing of the application. In the Eclipse you will be use the features of Maven for dependency management and Eclipse for development of application. Thanks to the Eclipse Maven plugins that now comes with the Eclipse which makes the development process much easier. After running the above command you can import the project in the Eclipse workspace. Eclipse and Maven provides good development environment for developing the Java based applications. Step 1: Extract the maven project which you want to import in Eclipse workspace if it is in the zip format. 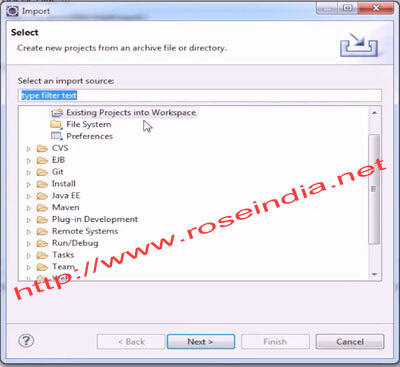 In this video you have learned how to import maven web application as Eclipse Web project in Eclipse IDE and then run the application in Eclipse.